Classes of Jennifer S. and Alicia L.
What exactly is phytoplankton and how is it different from other kinds of plankton? Phytoplankton is a one celled plant-like organism. Plankton refers to many different types of organisms that rely on the ocean currents to move them along. Are polar bears or other animals dying because of the changes? The loss of sea ice is reducing the habitat for polar bears and seals and other animals. 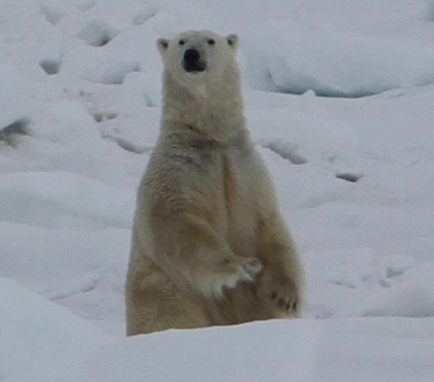 The reduction of life on the ice means that the polar bears will need to move on to land to find food. How might the melting ice affect the Earth’s weather patterns? If there is less ice then there is less sunlight being reflected back into the atmosphere. The sunlight is being absorbed into the ocean causing it to warm. The warmer arctic waters will change the weather patterns around the world. Do you and other people get to relax on the ship, like on a cruise? We do! Please read the post, “Ship Life” to find out how.